How do I access my SchoolPress Blogs? As a SchoolPress Manager go to Resources and find a gray Resource Board that contains the drop-downs for Portals and Private Pages. Select the portal that houses SchoolPress sites. Note: This may be called something other than SchoolPress. In many cases it is called Wordpress Blogs. To edit the settings for the SchoolPress site, click Settings. To edit the actual site, click Dashboard. Blog Address: Setup the URL address for users to access the blog from the website browser. Blog Name: Setup the name for the blog. 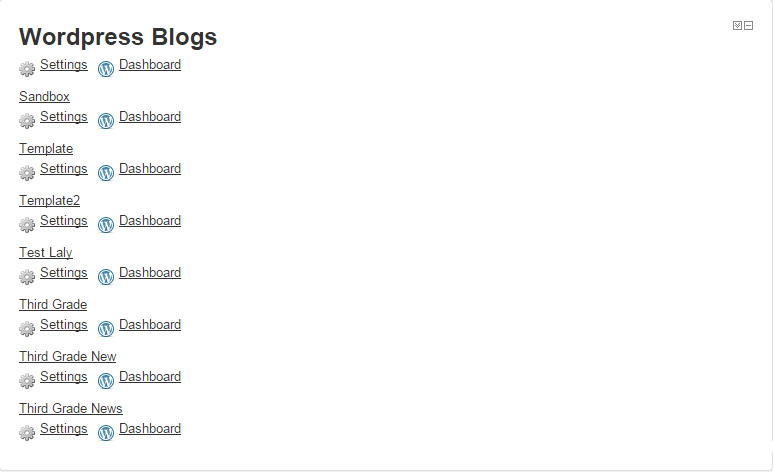 Default Blog Settings: Setup who can see the blog and make edits to it. Roster and Individual Access: Setup the users who have certain rights to editing and contributing content to the blog. The Dashboard is where content for the website can be updated. New posts, pages, content, site appearance, etc. take place in the Dashboard. SchoolPress Managers will spend most of the time editing the website from the Dashboard to make the site look the way it should, and to setup any tools, plugins, and site setting.